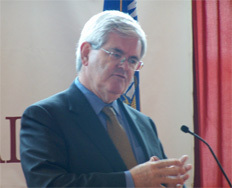 Former US House Speaker Newt Gingrich says health care reforms need to be a top priority in this country. That includes modernization to test early for illnesses and better manage them. Gingrich says work being done by his Center for Health Transformation will help to address many of the expensive health care issues facing Americans, such as diabetes. He says one of every four Medicare dollars currently goes towards managing that disease. Gingirch also took time with reporters during an appearance in Madison on Wednesday to discuss the presidential race. There&apos;s been some speculation that he&apos;s planning a run in 2008. However, he says that decision won&apos;t come before this fall. However, he did have kind words for former Wisconsin Governor Tommy Thompson&apos;s presidential bid, saying he has great respect for Thompson and believes he&apos;ll add a great talent to the race.